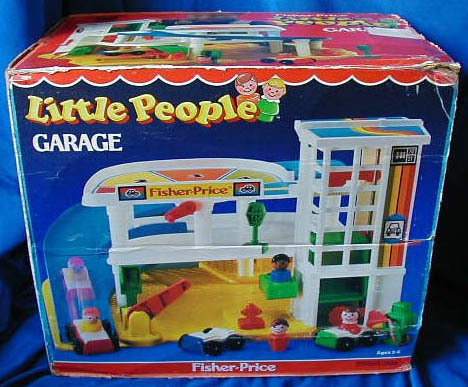 Description: The long-lived #930 Play Family Garage was replaced in 1986 with the #2504 Little People Garage. The first year of it's production, the "new" garage set wasn't very different than the #930. It had a red ramp opposed to the #930's white ramp, and the accessory service lift was bright green with no litho opposed to the dark green lift with a litho used on #930. 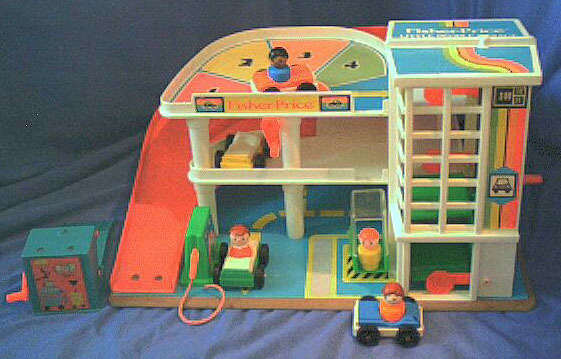 1987 brought drastic changes....the Garage base was made of yellow plastic opposed to masonite, the ramp was blue, and the set no longer came with a service lift. Opposed to a service lift, a short fire hydrant, an open phone booth, a parking meter, and a robot-looking gas pump took its place. The set could have maintained it's appeal with the blue ramp and no service lift, but the yellow plastic base was the killer. It just looks too cheap, bulky, and clumsy compared to the masonite base, and older children find it too baby-looking to play with. This is why most collectors, children, and parents buying for their children prefer the Garage sets that date prior to 1986. B2504R - Garage Base - Garage with a masonite base, a white 3-story elevator shaft, and a red plastic ramp on the back and side. FPT1019 - Green (bright green) service garage lift with a red crank and red drive-on car ramp. As the crank is turned, the lift moves up and down with a ratcheting sound. The back of the lift has NO litho. FPT884 - Blue top, white base garage style car. This car is marked "fp" and "Fisher-Price Toys" on the HOOD, it has a gas hole on the back corner, and it rolls on black 7/8" dia. wheels. The wheels are NOT marked "Fisher-Price Toys" and they are held on via metal axles. No C-hook on back of car. FPT886 - Green top, white base garage style car. This car is marked "fp" and "Fisher-Price Toys" on the HOOD, it has a gas hole on the back corner, and it rolls on black 7/8" dia. wheels. 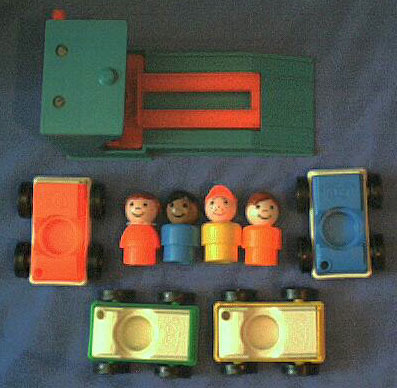 The wheels are NOT marked "Fisher-Price Toys" and they are held on via metal axles. No C-hook on back of car. FPT888 - Red top, white base garage style car. This car is marked "fp" and "Fisher-Price Toys" on the HOOD, it has a gas hole on the back corner, and it rolls on black 7/8" dia. wheels. The wheels are NOT marked "Fisher-Price Toys" and they are held on via metal axles. No C-hook on back of car. FPT890 - Yellow top, white base garage style car. This car is marked "fp" and "Fisher-Price Toys" on the HOOD, it has a gas hole on the back corner, and it rolls on black 7/8" dia. wheels. The wheels are NOT marked "Fisher-Price Toys" and they are held on via metal axles. No C-hook on back of car. *See "Variations" below. ETPP - Yellow boy smiling with a red baseball cap facing forward. AXPP - Blue African-American boy with black molded plastic hair. CYPP - Orange boy with brown molded plastic hair. GEPP - Light red girl with a dark brown sculpted bob. B2504B - Garage Base - Garage with a yellow plastic base, a white 3-story elevator shaft, and a blue plastic ramp on the back and side. *See Variations Below. FPT892 - White top, blue base garage style car. This car is marked "fp" and "Fisher-Price Toys" on the HOOD, it has a gas hole on the back corner, and it rolls on black 7/8" dia. wheels. 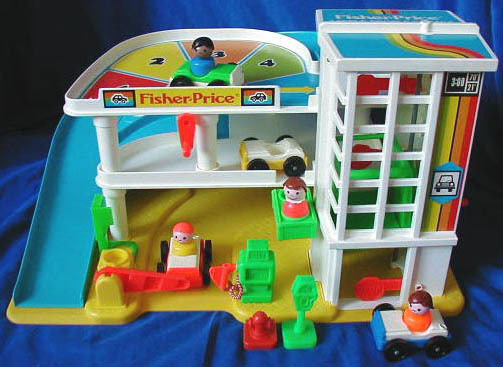 The wheels are NOT marked "Fisher-Price Toys" and they are held on via metal axles. No C-hook on back of car. *See "Variations" below. FPT894 - White top, green base garage style car. This car is marked "fp" and "Fisher-Price Toys" on the HOOD, it has a gas hole on the back corner, and it rolls on black 7/8" dia. wheels. The wheels are NOT marked "Fisher-Price Toys" and they are held on via metal axles. No C-hook on back of car. FPT896 - White top, red base garage style car. This car is marked "fp" and "Fisher-Price Toys" on the HOOD, it has a gas hole on the back corner, and it rolls on black 7/8" dia. wheels. The wheels are NOT marked "Fisher-Price Toys" and they are held on via metal axles. No C-hook on back of car. FPT898 - White top, yellow base garage style car. This car is marked "fp" and "Fisher-Price Toys" on the HOOD, it has a gas hole on the back corner, and it rolls on black 7/8" dia. wheels. The wheels are NOT marked "Fisher-Price Toys" and they are held on via metal axles. No C-hook on back of car. FPT246 - Green rectangular plastic "open" style payphone with a molded payphone and receiver handset on one side. The phone is mounted on a wide post with a square base. The base has a hole on the front for a Little People figure to "stand in" while "talking on the phone". FPT243 - Green plastic semi-diamond shaped parking meter that is mounted on a post with a square base. FPT284 - Green robot-looking gas pump with a square base and a red and white braided hose with an orange plastic nozzle on the end. FPT1221 - Small short red fire hydrant with a square base. B2504C - The yellow base blue ramp garage base was also available WITHOUT an attached service lift in the back. FPT892 - White top, blue base garage style car. This car is marked "fp" and "Fisher-Price Toys" on the HOOD, it has a gas hole on the back corner, and it rolls on black 7/8" dia. wheels. The wheels are NOT marked "Fisher-Price Toys" and they are held on via metal axles. No C-hook on back of car. FPT890 - Yellow top, white base garage style car. This car is marked "fp" and "Fisher-Price Toys" on the HOOD, it has a gas hole on the back corner, and it rolls on black 7/8" dia. wheels. The wheels are NOT marked "Fisher-Price Toys" and they are held on via metal axles. No C-hook on back of car. AYPP - The 1988 Fisher-Price Swedish dealers catalogue pictures this set with a blue Asian boy with slanted eyes and black molded plastic hair. GLPP - The red girl with brown hair could also have a dark red body. 1986 - FP2504BOX1986 (Box ONLY) - Sold in a 18-7/8" long, 15-3/4" high, 11-1/8" deep box featuring a garage with a RED ramp. 1987-1990 - FP2504BOX1987 (Box ONLY) - Sold in a 18-1/4" long, 15-7/8" high, 11-1/4" deep box featuring a garage with a BLUE ramp. This is a reissue of 1970's #930 Play Family Garage.